Laura Probert kindly accepted to help me out with a month of art inspiration for my online art journaling group. She is a great writer and has written for many online publications like Huffington Post and Elephant Journal. She is passionate about healing and uses writing and art, among other things, as tools to dive deeply inside and heal the wounds we carry. Awareness is the key to healing. I’ve spent my 21 year career as a student, healer and an athlete learning the tools, tips and tricks that will help you wake up and develop a practice of awareness. Healing is about peeling off the layers of mental, emotional and physical injury and trauma that cover up your soul and keep you from living the best, healthiest, most joyful life you can live. Awareness can help you heal physical pain and injury, relationships, business ventures, exercise goals…basically anything you want to change in your life. I like the idea that Laura offers tools for self healing and not trying to heal “you.” Ultimately, we are the only ones who can heal ourselves. My journey has been about stepping into my power, claiming my self-worth and finding and expressing my unique voice. Being brave has been necessary and facing and moving through my fears has been a powerful process. When you connect with what you love, you move toward healing. When you heal, you are able to connect more with what you love. Laura’s healing programs, classes, workshops and books will help you redefine healing and take your journey to the next level. 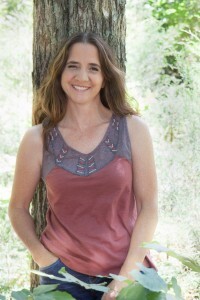 She’s able to combine the tools she’s learned for healing with the tools she’s learned for creative flow to create programs that are powerful, unique and integrated. She’s helping to move the knowledge of mind body connection from idea to action and teaches it in an immediately applicable way. When she’s not igniting transformation in her clients you’ll find her writing, hanging with her kids, dogs or a horse, hiking in the woods, practicing her axe kick, or taste testing dark chocolate. Find her on Facebook at Warrior Love or via her WEBSITE. I would have to say that Laura Probert is a cool person to know and she GETS RESULTS because she’s not afraid to dive deep. That is very inspiring to me. If you didn’t sign up for the free 2017 art journal prompts you can do so HERE.